The four Utah Chipotle Mexican Grill locations (Chipotle.com) will honor military personnel on Flag Day—June 14—from 3-7 p.m. by giving away free burritos when they show a valid U.S. military ID. Ten-hut! 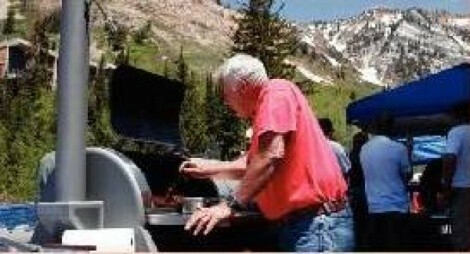 The 2nd annual Grill on the Hill BBQ Championship and Brewfest at Snowbird takes place Friday, June 19, through Sunday, June 21. Presented by the Snowbird Renaissance Center (SnowbirdRC.org), The Grill on the Hill will feature some of the country’s most bodacious barbecue chefs as they compete in a state championship qualifying event sanctioned by the Kansas City BBQ Society. As a certified Kansas City BBQ Society judge, I’ll be there to cast my vote in the categories of pork ribs, pork shoulder, beef brisket and barbecue chicken. The Grill on the Hill is free, open to the public and will offer great barbecue, kids’ games, a kids’ art area, a marketplace, beer garden and live music, including the band Great American Taxi on Friday night. So come on up and enjoy the fun. Kimi and Staffan Eklund (former owners of Absolute and Dijon restaurants) have taken over ownership of Creekside Café at Solitude Resort, which is now called Kimi’s Mountainside Bistro. A summer alpine patio brunch buffet is served on Saturdays and Sunday from 10 a.m.-3 p.m., while dinner at Kimi’s runs Wednesday through Sunday 5-9 p.m. during the summer. I took a peek at the tentative menu (still a work in progress). Kimi plans to feature an array of salads and soups (including a chanterelle mushroom soup with applewood-smoked bacon and lingonberries), wood-fired pizzas, sandwiches and entrees like chicken schnitzel, bistecca, baby-back ribs and Pacific salmon with dill creme. Call 801- 536-5787 for reservations.